There have been some heartfelt letters to the Press in York recently regarding this year’s production of the York Mystery Plays, part of the ‘York 800′ festival, regarding the decision to use 1950s dress, which has rather surprised many people. Even more surprising is the frequent assertion, repeated on the just-launched website of the ‘York Stories 2012′ project (also part of the ‘York 800′ festival) that the plays this summer will be ‘performed outdoors in the Museum Gardens for the first time since the 1980s’. So what I saw in 2006 and 2010 in the Museum Gardens was a mirage of some kind, presumably. 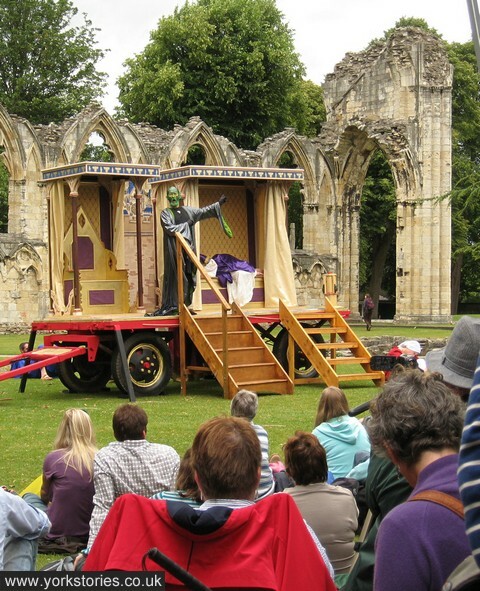 My camera also recorded the mirage, of the York Mystery Plays in 2010, as pictured here. Clearly that’s the abbey ruins in the background. In the Museum Gardens. Outdoors. It might not look so impressive, because it’s not so big, it’s not on a massive fixed stage, and no famous names are involved. But if you want ‘authentic’ York Mystery Plays, how about a production that moves through the streets on waggons, playing at different locations, rather in the way our medieval ancestors approached it? The York Mystery Plays as I saw them were entertaining, authentic, thought-provoking, tear-jerking in parts, inventive, creative. But most of all, accessible, because they were free to anyone wandering by. Which is how it would have been, back then. Our ancestors didn’t need a ticket. It’s odd, really, that something that I and other people valued so much has been apparently eradicated from our recent history, in official proclamations from York 800. My one and only attendance at the Mystery Plays,was the post war revival in the Museum Gardens,mainly because a Nunthorpe(R.I.P. )Grammar school ex schoolboy friend ,name of John White,(nicknamed ‘Shirty’,later became actor Richard Conway) took part dressed in a loincloth, I think,and very fetching he was too!A young lass called ‘Judi’ took part also(the daughter of our family Doctor Dench),so I was probably privileged to see the launch of a great acting career.I believe it was around 1951 or so,if my memory is correct,along time ago!